As far back as I can remember, crackly Roast Pork (Siew Yoke) was only served during festivals and special occasions like weddings, milestone birthdays, and baby’s full moon (celebration of baby’s first month of life). An entire roast pig or siew chee had to be ordered from the butcher. The choicest part of the roast pig was the belly because it was the most tasty and the crackling most crispy. The ribs were also in demand. The other parts were less desirable and were kept for making soups or cut up and used in other dishes. Somewhere along the way, someone came up with the idea of roasting just the pork belly itself. This resulted in a very tasty and crispy crackling. 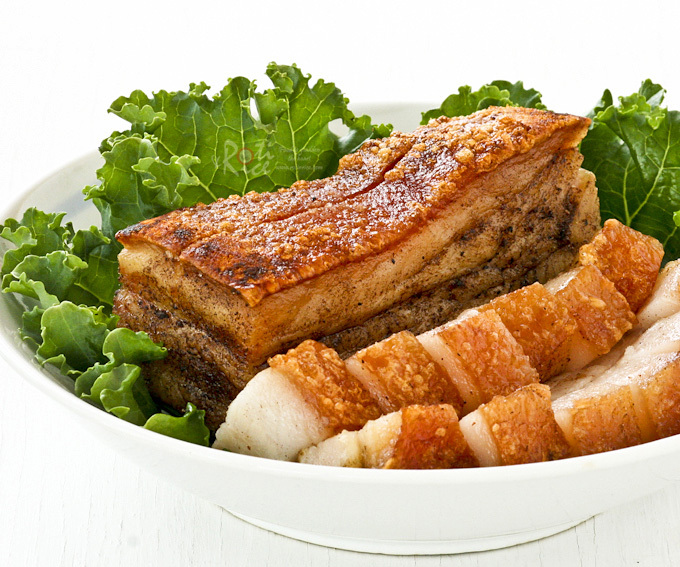 That was when chicken rice hawkers started offering Siew Yoke (Roast Pork Belly) in addition to boiled or roast chicken. This Roast Pork Belly became really popular. Instead of going to the butcher, people went to the hawkers for small portions of this delectable meat. Not long after that, these enterprising hawkers started accepting orders by the pound for the Chinese New Year and other festivities. Here in the US, regular grocery stores seldom offer pork belly for sale as most of it is used for making bacon. Asian grocery stores usually sell them in slabs or strips. It is best to purchase an entire slab if possible. This store that I went to did not have slabs and so I had to buy strips instead. The preparation remains the same but the cooking time may vary slightly. Strips will cook a little faster. Please adjust time accordingly. 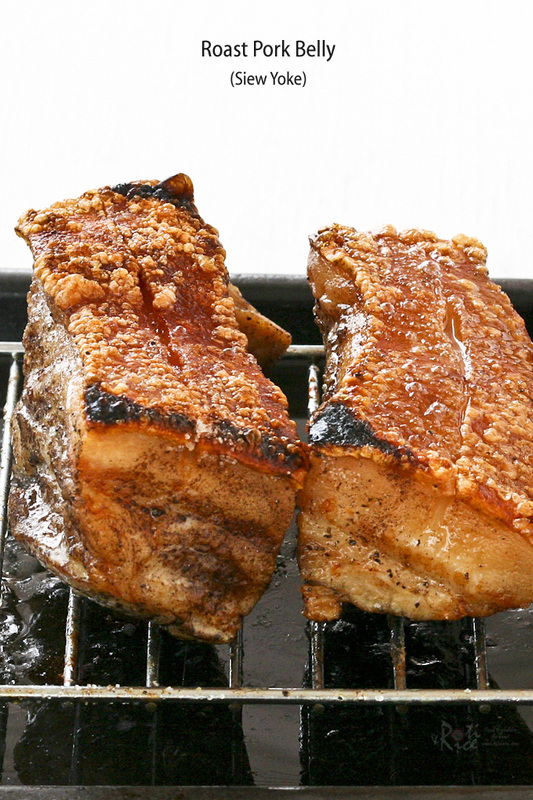 To ensure a crispy crackling, the pork belly should be thoroughly dried with paper towels. It should then be left uncovered in the refrigerator overnight on a rack. The purpose of scalding the pork is to remove impurities and also to soften the rind for easy piercing. Be generous with the salt on the rind. It should be evenly coated. Roast pork belly is quite delicious. My boys love it too. The five-spice give it a little more flavor. Roti this looks so tempting. I love that the skin is crunchy. Thanks Mari! The crunchy skin is what makes this pork so tasty. Xin Nian Kwai Le to you and your family, Biren. 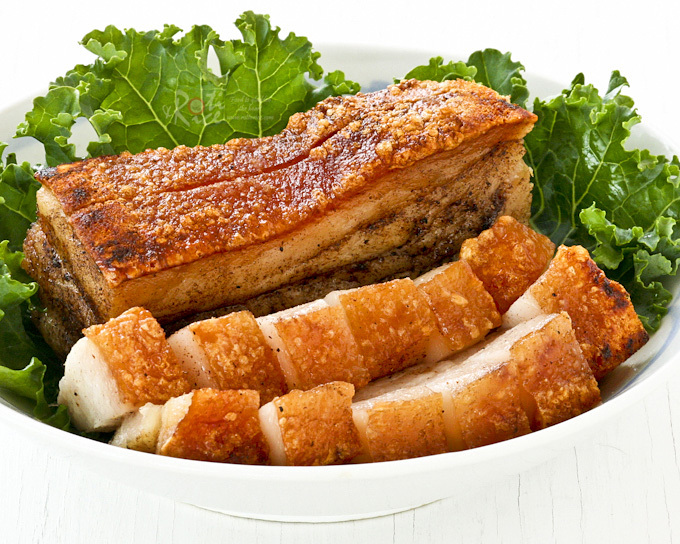 Your roast pork looked so delicious and the crackling looked great! I made the same dish for lunch yesterday and they were all gone, though I must say I need more practice in getting the crackling to blister more evenly! Lovely post as always,Biren. 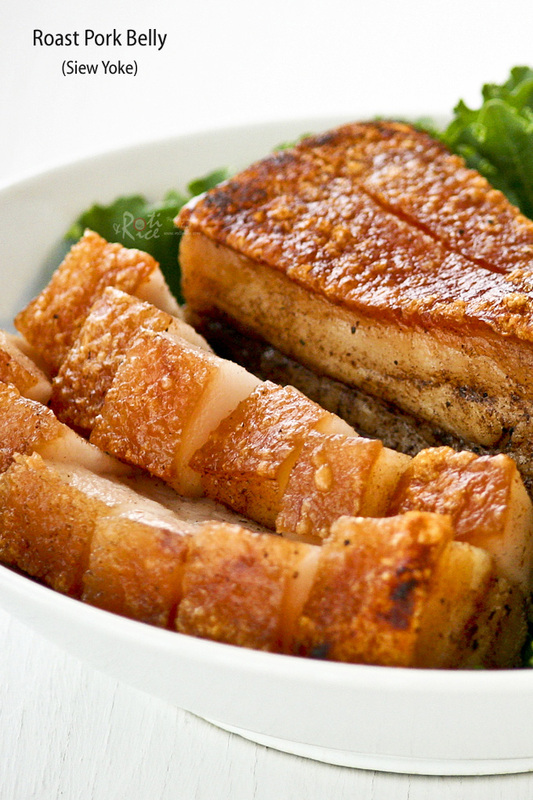 Oh Biren – this pork belly looks perfect! I love the crackling on the top! We use to just make crackling without the belly. I love it! WoW your roast pork turns out perfect & nice. The leftover can also be used in making ‘kuo rou’. I bet your kids love it too. There is usually hardly any leftovers unless I plan for it by making extra. I am not sure what “kuo rou” is but I use the leftovers to make “chai boey” or chop suey soup. yup – tried it with vinegar – waste of vinegar 🙁 . This is truly a lovely dish with much meaning! I remember we used to have this (the whole roasted pig from the butcher) at special festivals and the butcher would put newspaper all over the floor in the kitchen and with his huge meat ckleaver and wooden chopping board he would set about cutting the pig in the most methodical way. The belly he would cut and arrange separate on a plate, and we would offer it to the gods, and say blessings, then we would eat it, with toothpicks, and maybe dip it in a bit of hoi sin sauce. It was really a big occasion to have such a butcher man prepare this before all the guests!. A wonderful special dish! Biren, I don’t take pork. I am thinking of trying it with lamb. Do you think it will work? I am not sure if lamb would work and if a cut similar to pork belly with the rind may be purchased. Thank you for this fabulous recipe. I cooked it this afternoon after starting it last night. We shared it with friends and everyone agreed that it was better than the crispy pork from the local market here in Penang. Amazing recipe. Made it and it was delicious.